It’s that time of year again. The turning of the year. The leaves have finally started falling and are doing it in abundance, the clocks have gone back, the days seem darker, there is rain about and kids. Kids everywhere as they are off school for the week. Not unsurprisingly, this has all led to a lessening in my sewing output, helped along by an intermittent stomach bug (that thankfully only seems to affect me). 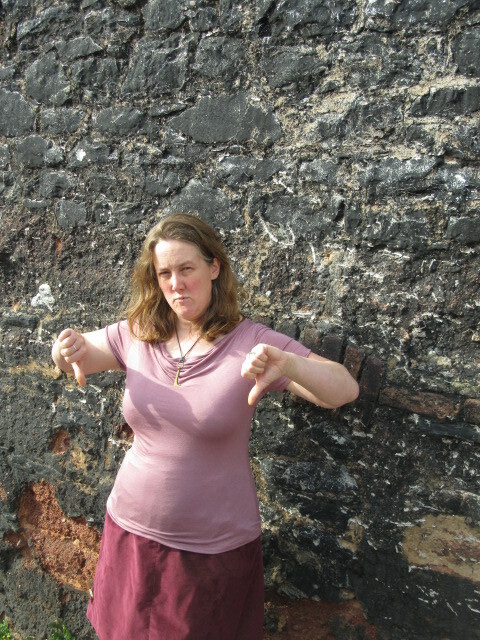 The only photographic evidence I have of the shirt, back in the happy days of the project before I started attaching sleeves and it all went wrong. Also, I had a setback. I started a shirt, I was being good, using stash for a “wearable muslin”, so I could justify buying some new fabric I’d spied. So I pieced it together out of leftovers, but then I came to try it on and the sleeves are too tight. (Well, one sleeve is. 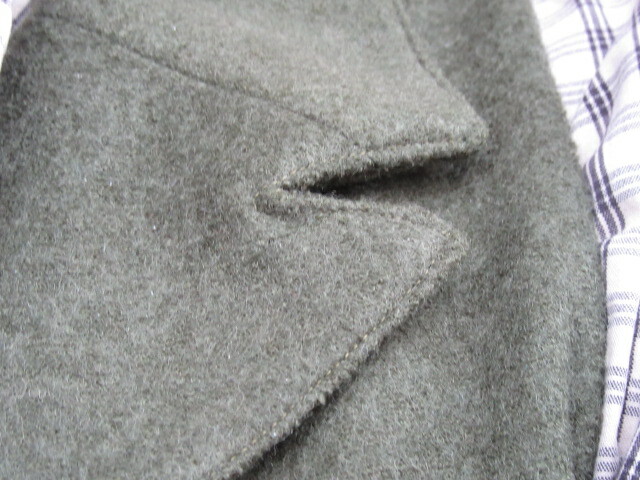 The second isn’t sewed up as I realised I’d topstitched the seam allowance at the shoulder down before finishing it). Properly too tight. As in I can get it on but I can’t bend my arms in it. At this stage, I realised that my “scraps” of fabric were very precious to me and I’m now sulking big time at the waste, unable to work out how to proceed (not enough fabric left to cut much more than a new sleeve cuff, let alone two whole sleeves and with 2 colours of fabric being used already I didn’t want to introduce a third into the mix and I don’t wear sleeveless tops). I’m edging towards finishing it anyway and then finding someone (with big bust and thin arms) to foister it onto, but my motivation on that one is low. My motivation on my next projects is low too as they’re all much needed bulky jumper type garments where even appropriate “muslin” fabric is fairly expensive and I’m worried about encountering the same fit issues. (Namely the sleeve size corresponding to my upper bust measurement being too small, but the full bust measurement being too big at my upper chest). Plus they seem “big” projects and I’m not sure I have the energy. Woe is me, cue the violins. 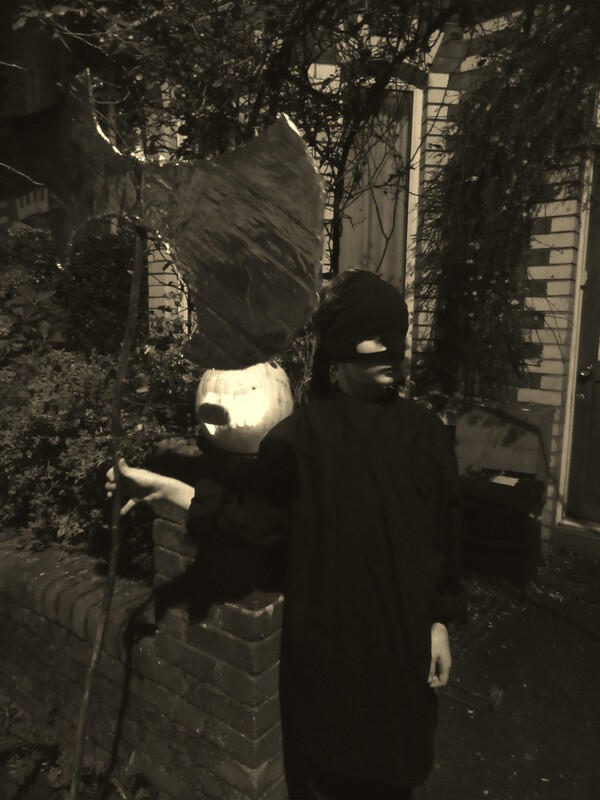 However, with Samhain/Halloween/All Hallow’s Eve tomorrow, the kids are all excited about dressing up and going Trick or Treating (there aren’t many sweets to be had in this house usually, cake yes, chocolate maybe, but sweets have a half forbidden allure). 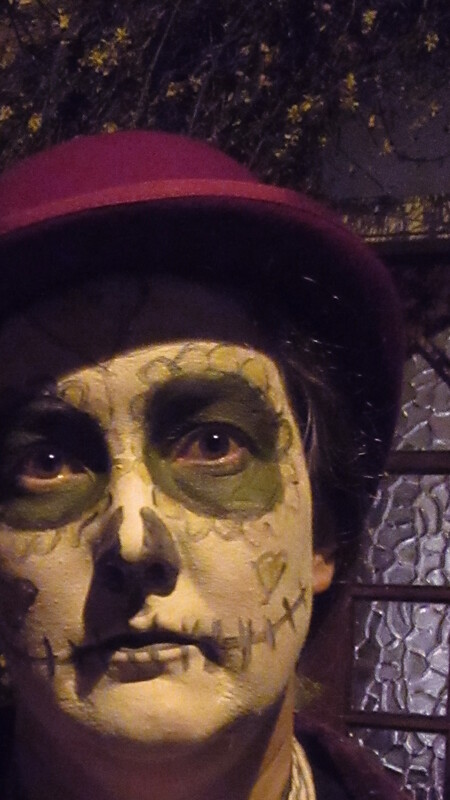 So we have some costumes to cobble together. Unsurprisingly the boy is being semi secretive, ridiculously complicated, unrealistic about time scales and bad at clear communication. I fear a temper tantrum tomorrow. 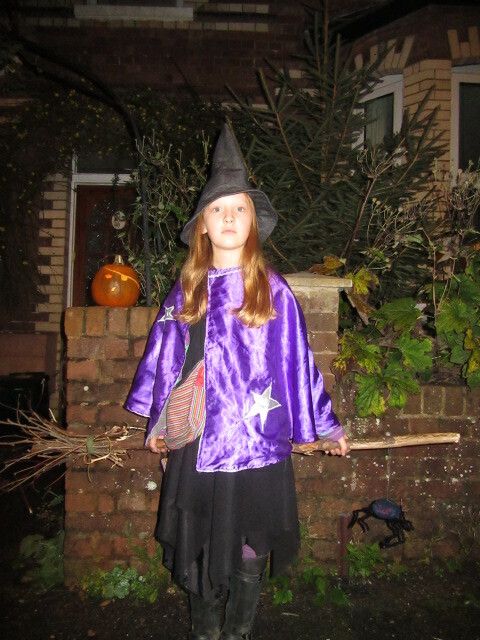 His sister, however, is more practical, having briefly considered being a Mummy (of the ancient Egyptian variety) she then went with witch, as she had no strong opinions and we already had the dress. Hooray. 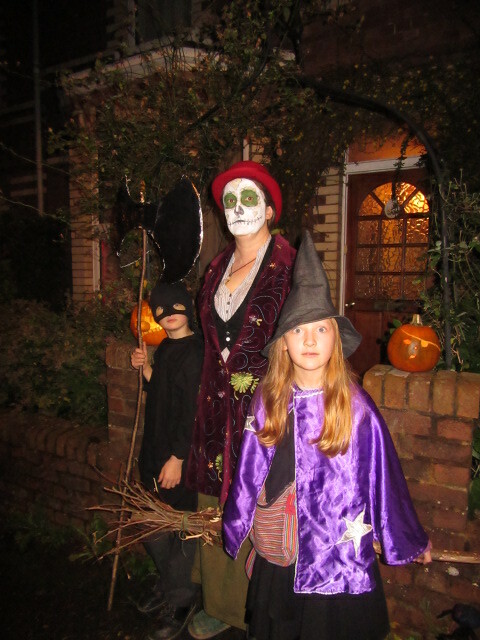 (Note for any curious American readers, contrary to rumour, we do “have” Halloween in the UK, but the costumes are almost exclusively on the ghost/vampire/zombie/witch/black cat spooky/scary theme – rather than the general dressing up fest it seems to be stateside. Now, I’m all for home made costumes, for many reasons, including the fun of making them, the flexing of your imagination, not buying badly made itchy generic outfits that have been made under who knows what circumstances and will likely be worn only once. This year I have added safety to my list, after watching this interview with Clauda Winkleman about how her daughter caught fire. (Although I’m aware that there’s still a lot of synthetic content in her dress, at least her outfit has a lot of cotton fabric too). So, the hat problem raised it’s head. Last year I made my daughter a paper witches hat, this year she wants better. But after seeing the clip above my reservations about buying one are increased. However, I didn’t think I had any black fabric in my stash, and I don’t want to buy any (none bought in October so far, don’t want to stop now). 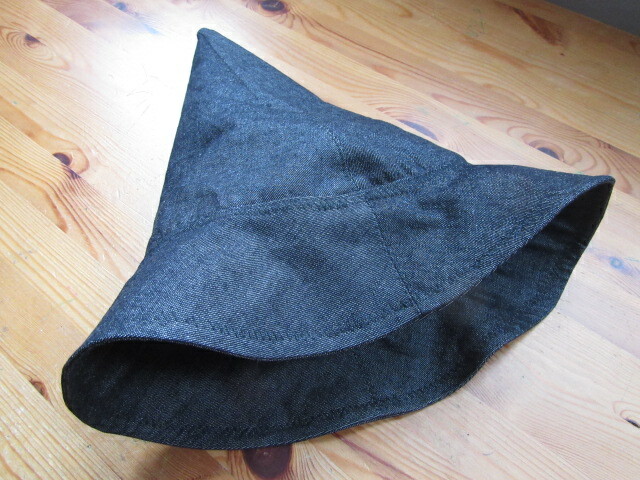 So, I had a good rummage, and found a strange t shaped piece of black denim (left over from these trousers I think – which incidentally have just been passed on). She wasn’t that impressed as the warp threads are white, but I managed to convince her. I altered my much used Oliver and S bucket hat pattern. 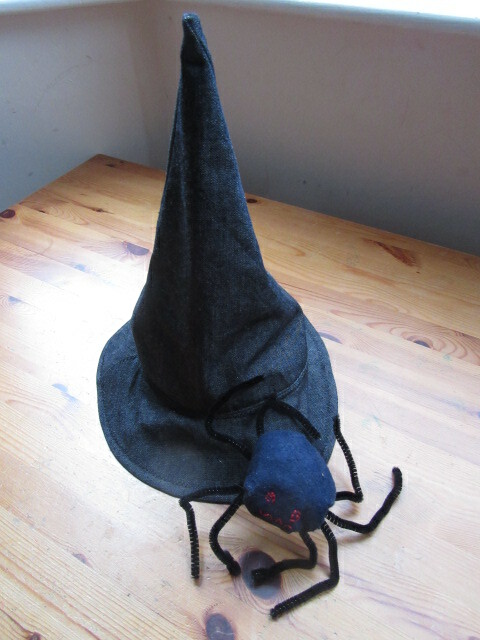 I extended the brim slightly outwards for a more witchy look and extended the side pieces upwards to a point. Of course, the crown is eliminated altogether, which misses out that seam (if you’ve made the hat, you’ll know what I’m talking about). Initially I just extended the sides of the side piece up to a point but that ended up way too tall, so I changed the angle slightly for a more proportioned hat. I just had enough fabric to cut out my pieces, result. And then I assembled it, which was very simple. I interface my two side pieces (the point isn’t lined, I wasn’t after a reversible hat) and two of my brim pieces with my thickest interfacing (I would’ve done all 4 brims but I ran out of interfacing). I zig zagged around the inner and outer edge of the brim rather than using concentric lines of stitching to make it look less sunhatey. 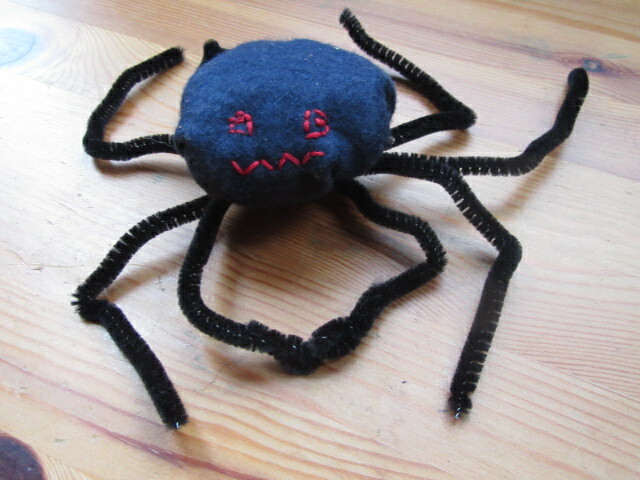 It’s basically a circle of felt, drawn into a ball, stuffed with offcuts of fabric, 4 pipecleaners sewn on for legs (we had to buy some especially as there were none black in the house – the girl insisted) and features stitched on. We think it looks pretty good. So, that’s my “short” update. Hopefully I can post a picture of happy kids in not too flammable, not too wasteful costumes tomorrow. It’s been one of those sorts of weeks around here. A chipping away at stuff kind of week. First the bad news, I made another Day to Night T shirt and I hate it. I used the same pattern iteration as last time, so in theory it should work. But I hate it. I got this fabric to got with the lovely bundle of stuff that Crystal sent me (don’t ask for a progress report on that right now, ok), it was the best colour match in the shop, but its a horrible colour on me, what was I thinking of? Also, its a slinky fabric that clings to every lump and bump and does nothing for me. I’m putting this photo up here to remind Future Me never to buy this kind of fabric again. I hate it. I know this. What was I thinking of? 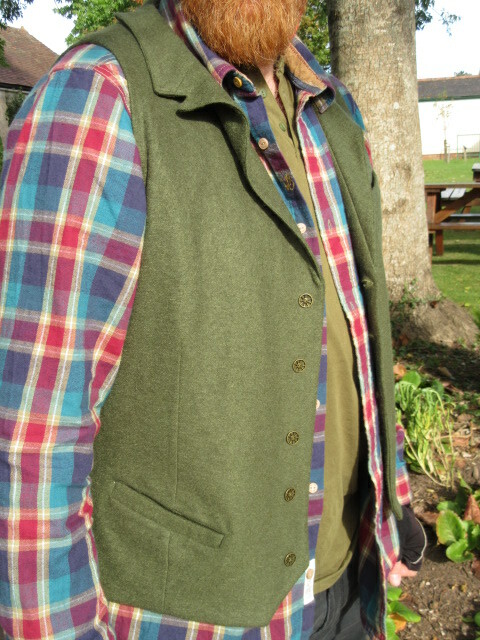 Next up, in mixed news, hubby has been wearing his new waistcoat and doesn’t the colour look good with this shirt. I got lots of lovely comments about it, thank you and I know it’s not that bad, but you can see here, the trouble with the collar, which likes to roll up on itself. 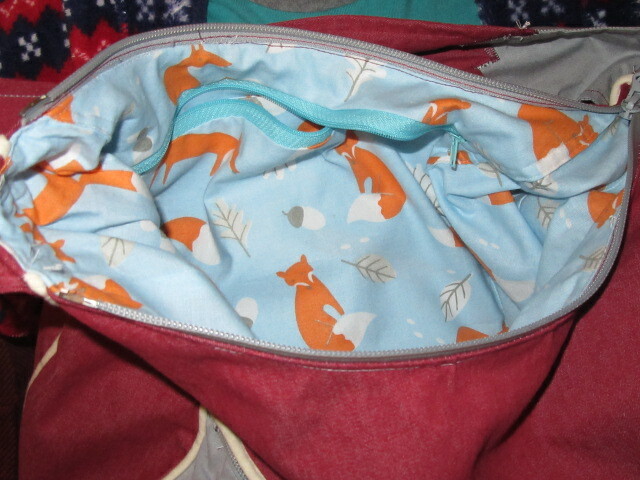 Also, despite understitching the seam, the lining is still starting to bag out and I keep seeing flashes of it. It’s not as bad as on the last one but I’m wondering how I stop this happening in future. Do I need to topstitch this bottom hem? 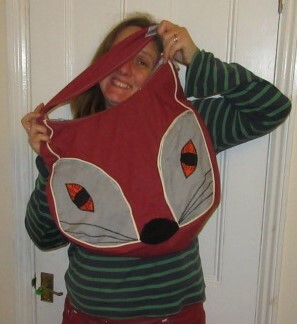 Or have a facing of main fabric along the bottom of the lining maybe? Finally, on a good note, we have started a long process at home of swapping some rooms round, which will mean I get a better sewing space eventually. At the moment I’m sorting through some of my mounds of stuff and as part of that process I made a couple of “buffs” from scrap jersey. Now to find a child with a head small enough to wear them. I also got myself some more psycadelic underwear to brighten up grey autumn mornings. This photo was taken indoors on a grey day so really doesn’t show you quite how bright they are. 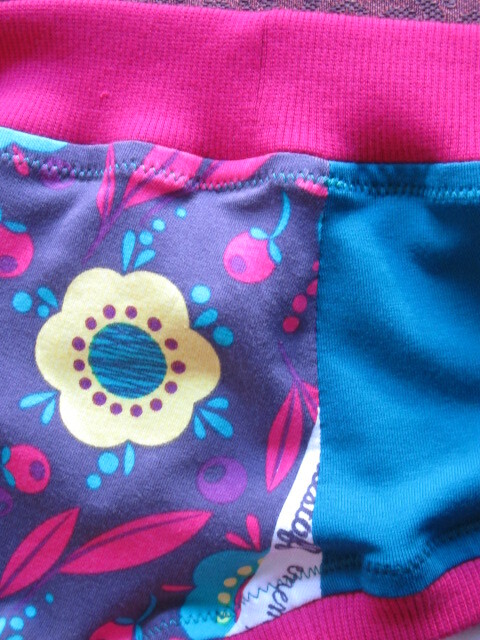 This pair are flowery at the back, teal at the front and have hot pink ribbing bands. I had to squeeze them out of the fabric so a bit of the margin printing shows, but I don’t care. Amazingly the flowers are still symmetrical a the back. 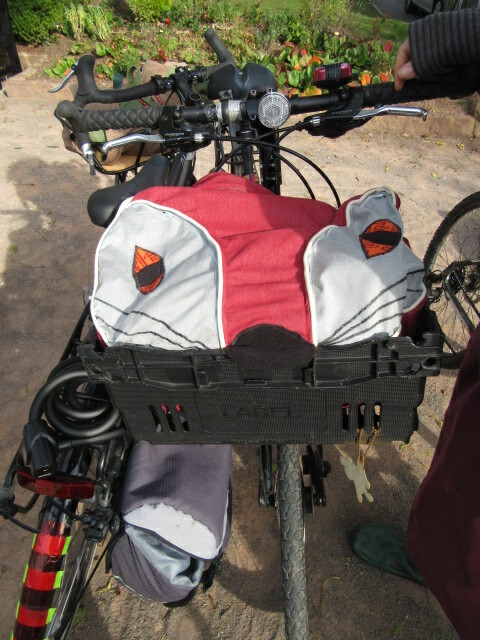 Finally, my new bag has been getting a lot of use and I’m particularly tickled by how it looks in the box on the front of my bike. I don’t make many clothes for my long suffering husband. I offered to make him a t shirt recently, as he was eyeing up some henly style ones in a shop, I casually mentioned that I had a pattern for one like that at home, but he quickly dismissed that stating that he “liked to choose the designs on the front of his t shirts”. Then, a few weeks later, he brought home 3 plain short sleeved henly t shirts. I would sigh at this point but there’s no way I’d turn them out that fast. 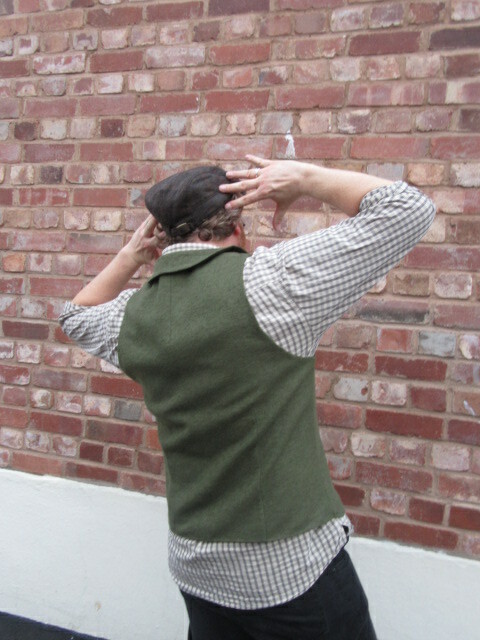 However, I have made him several waistcoats, or vests if you prefer (which sounds weird if you’re British as here a vest is an undergarment, like a tank). First off was one to wear when he was being an usher at a friends wedding, a long time ago, before we were married. I was supposed to be making waistcoats for the groom, best man and the other usher too, but I got out of that little sewing obligation by getting shingles. Not recommended. 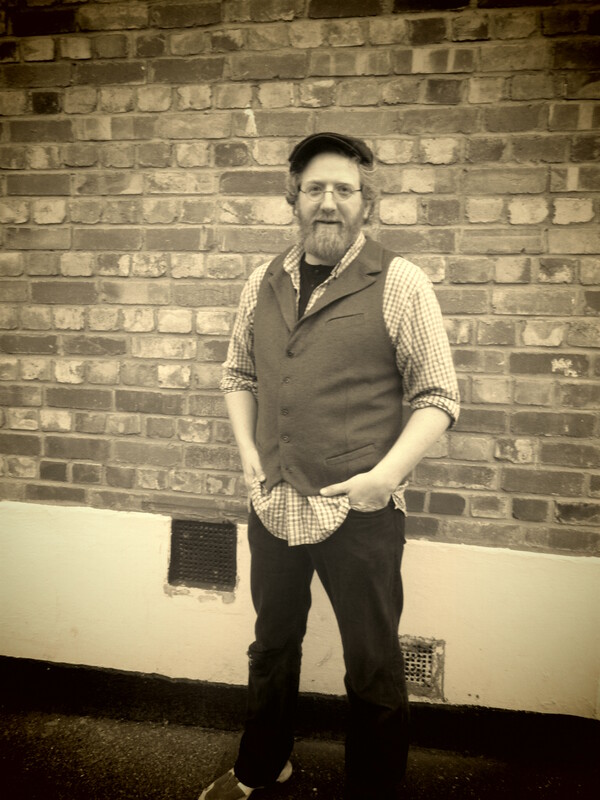 He still has it (the waistcoat, not shingles, he’s never had that) but its definitely not everyday wear fabric. Next up, out of a request for an everyday waistcoat, I made a muslin out of stash. It started very purple, but then he dyed it with black dye and it ended up a very dark indigo kind of colour. It has got worn quite a bit, even whilst it was purple. The purple one saw less wear once I made the “final” version, which despite a dodgy collar and the lining bagging out at the back, gets worn a lot. However it took me a year to finish it and I only managed it in the end when he started threatening to buy a shop bought one instead. 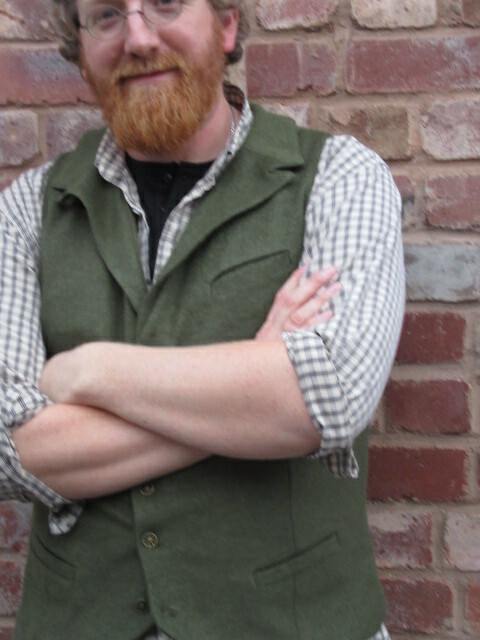 During my post completion high though, I decided that waistcoats were easy and I would make another one, but this time with a better collar (I think I might have sewn the lapels on backwards on the grey one). 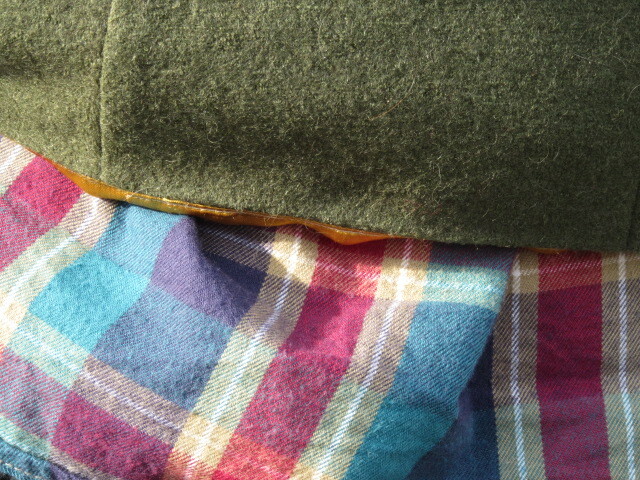 We went fabric shopping, he chose some green boiled wool (I think) and a striking gold for the lining and I sewed up the lining and sewed the outer pieces together and did 3 of the 4 darts, then I stopped. No idea why. It got put on one side and languished. Until a couple of days ago when a combination of my guilty coincidence, a desire to do something nice for him, and the bad light in the evening which meant I didn’t want to cut a new thing out for him spurred me on and I decided to finish it. At least I’ve taken under a year this time, rather than over! 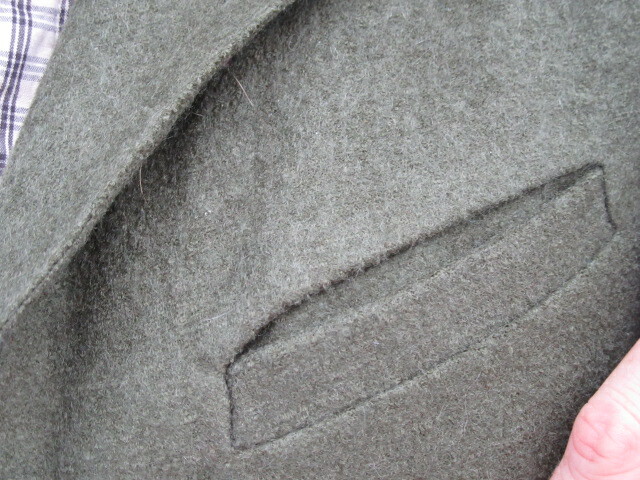 First I stuffed up the welt pockets. They were going fine, using this method, but then at some point when I turned my back they developed a gap along the top of the welt. I think it might be due to not being carefully enough sewing my lining together in a way I can picture but not described. Anyway, I put it on one side to see how I felt in the morning and discovered that I felt annoyed but not enough so to try and redo welt pockets. So onwards it was and I cut out and sewed up the collar – making it an inch wider at the back than last time as that one gets really narrow there. Then I also made a hot mess of the collar. 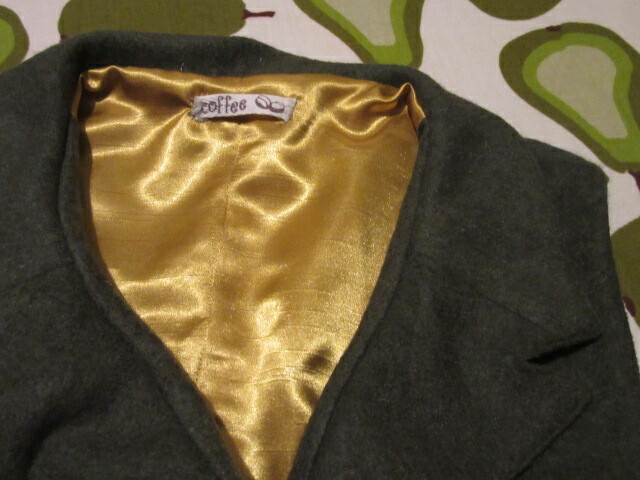 I carefully marked my pieces so I didn’t so the lapels on backwards but WHAT is happening with that seam, seriously? 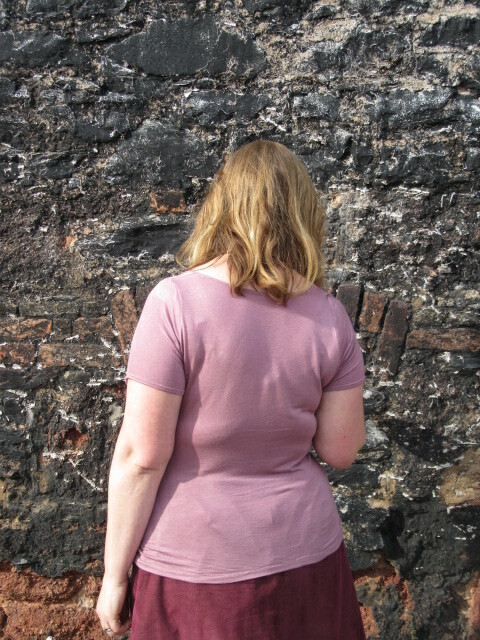 It doesn’t lie flat and hubby pointed out that the gap from collar edge to armhole is noticeably different on each side. Looking back on it now, I think the purple one looks better as the collar is stiffer, which at first I thought was calico rather than wool, but then I realised I didn’t interface any collar/lapel pieces this time around (can’t remember last time around) which surely isn’t helping. Again, I left it overnight and decided that whilst I wasn’t happy I wasn’t sure unpicking would help, so I finished it. 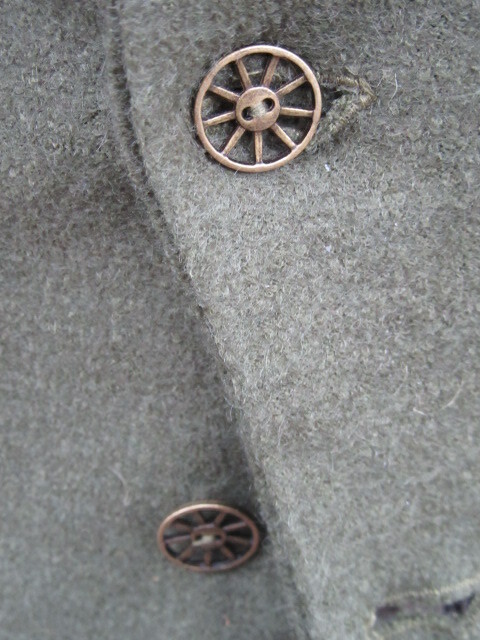 At least the buttonholes went reasonably well this time. So, in conclusion, hubby has a new waistcoat and is very pleased and smiley about it. And I know from last times experience that I will eventually stop wincing at it every time he walks into a room. And I do think the collar is less bad this time. He does like it, honest. And next time? Surely there will be a next time. 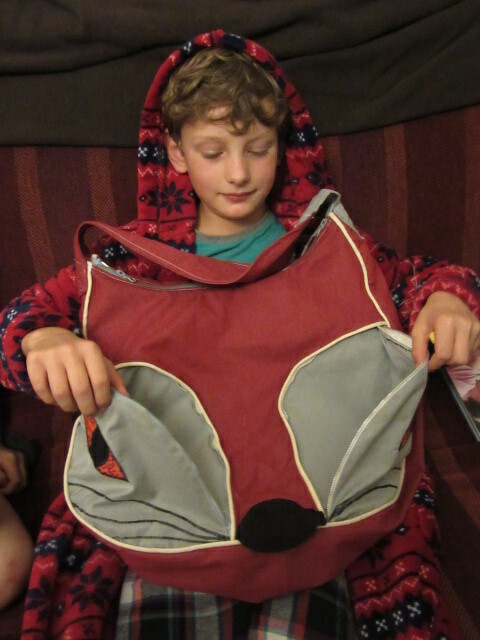 After all he shows no sign of stopping wearing waistcoats and struggles to find ones he wants in the shops (and those he does see cost around £100, so making them is definitely cost effective even after expensive wool fabric purchase) and I am determined to get it right. Well, I’ve now spied a pattern which appears to have the “proper” collar he wants, rather than one that ends at the shoulder seam, so should be a better start for all the other alterations he requires, as my collar drafting skills, indeed my collar construction skills, are clearly lacking and I could use a little professional help here in the form of pattern pieces and instructions. Lets just hope I keep whittling down my construction times! Talking of which, as an added bonus, I made myself some “subtle” pants, out of knit leftovers and some of my ribbing stash from impulse online ribbing purchase earlier this year (it is impossible to buy locally). These did not take long to sew up once cut out, in fact I sewed them up before breakfast on Saturday as it was such a dreary grey day and I needed cheering up. Another pair of Barrie Briefs, but this time the banding feels more comfortable around my leg, which I assume is because the ribbing has more stretch than using jersey. can you make them out against the backdrop? 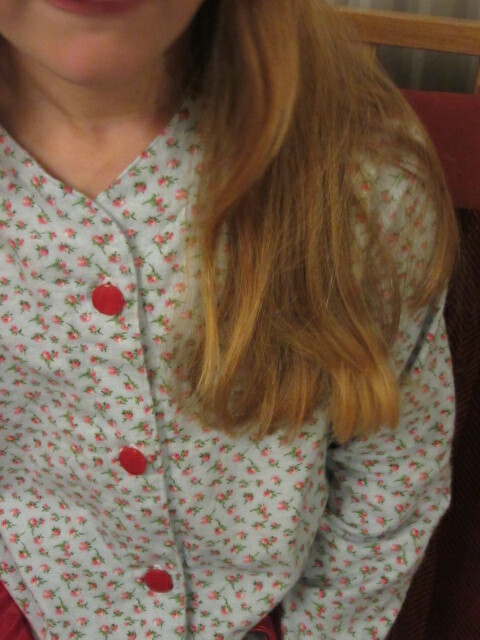 So, I made the girl some Oliver and S sleepover pyjama’s in some lovely soft brushed cotton covered in rosebuds. It only took a year. Yup, that’s right, I said a year. I made them both pyjama bottoms last year and then they got put on one side and I did no more. 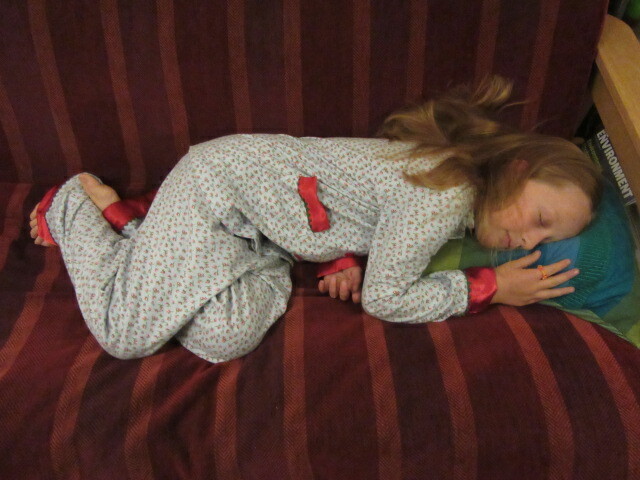 I dug them out again this week to finish off when I realised that she needs new pyjamas. They’re still slightly big now, luckily they were huge last year. 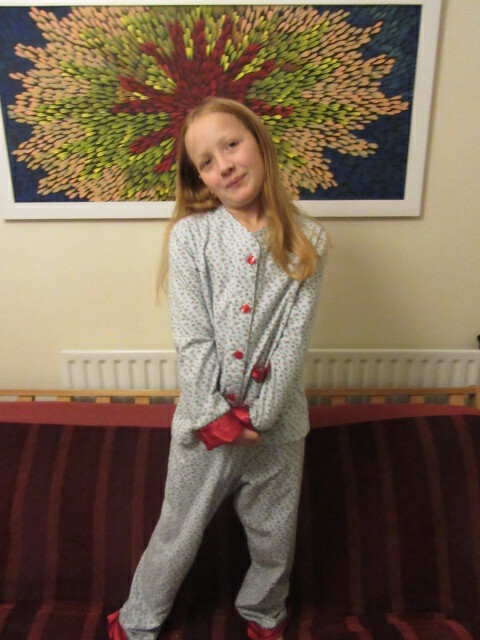 These are the age 8, modelled by my 7 1/2 year old whose in age 9ish in shop bought clothes. The pattern calls for contrast fabric for trouser cuffs, pocket tops and the facing. 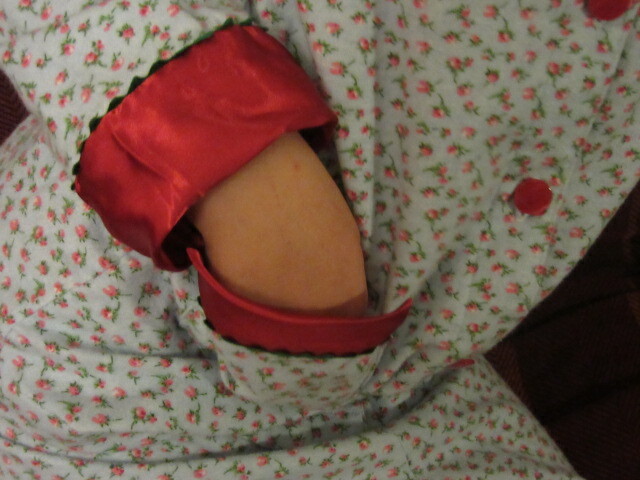 I cut up a charity shop find satin nighty for my contrast because the girl loves all things feely. Should’ve noticed sooner the garment I was cutting up was cut on the bias as my trouser cuffs, carefully cut horizontally in alignment with the garment came out bias cut too and were really hard to work with. 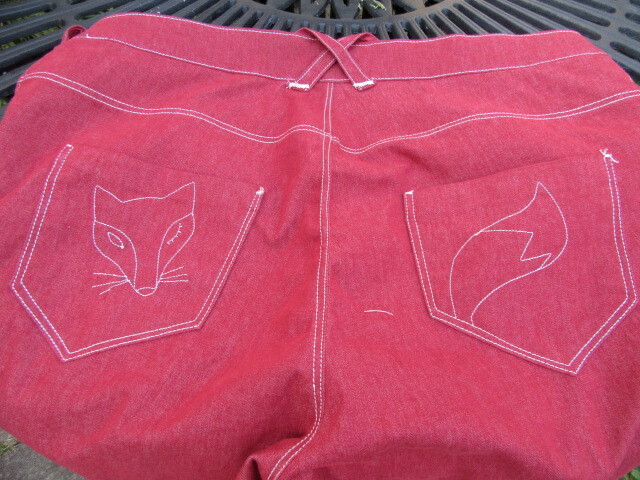 I actually made the facing in the brushed cotton, mainly for my own sanity. But that meant I had enough left to make some contrast cuffs for the top too. All the contrast fabric has bias trim from the stash too, however its a bit hit and miss which way it’s facing! 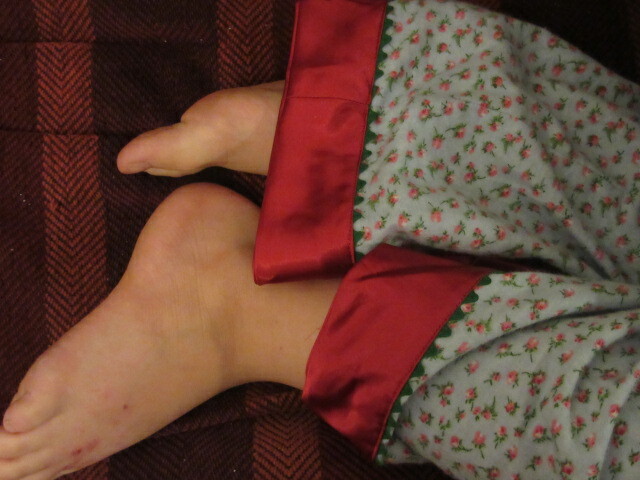 So, one set of pyjamas finished and off the “to do pile”, one more to go. I guess this counts as seasonal sewing. I’m trying to bribe myself with some shopping for new fabric at the end of the month if I sew up some of my pile. 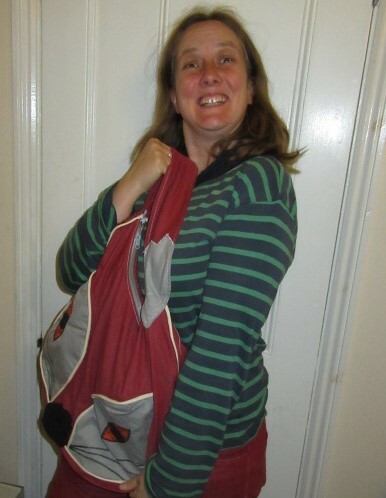 What do you get if you cross Foxy Jeans Remnants with Seamstress Erin’s Presido Purse? This was supposed to be my accessory for the September Outfit A Long, but I ran out of time. The shame is that I didn’t admit this sooner, as bits of it are a bit rushed. It was much easier to finish it after the deadline once the pressure was off. 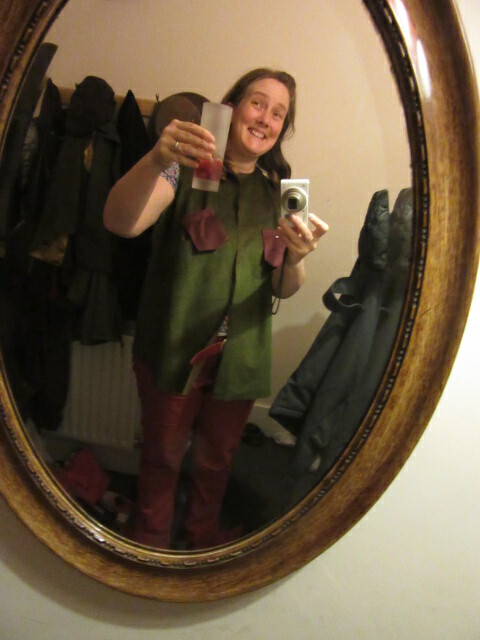 (Actually, technically it needs a smidgen hand sewing to finish off, but I can’t be arsed am too tired tonight. I took lots of photo’s whilst making it so could write a quick pattern hack/tutorial if anyone’s interested – let me know in the comments below. 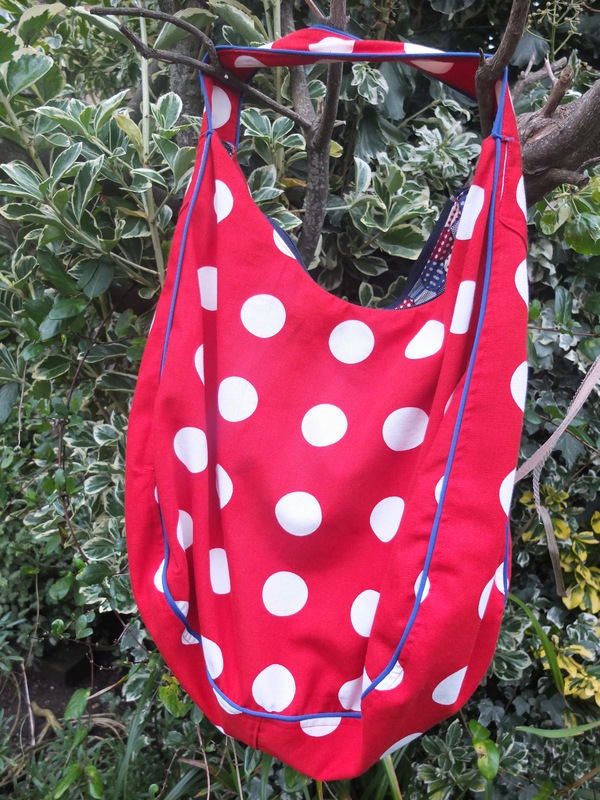 All in all, a fun new hack of an old favourite pattern (I am too embarrassed to count how many times I have made the Presido, although this is only the second for me as my first is starting to wear out from overuse).